The United States Congress designated the Waldo Lake Wilderness (map) in 1984 and it now has a total of 36,868 acres. All of this wilderness is located in Oregon and is managed by the Forest Service. 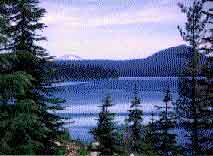 The Waldo Lake Wilderness is bordered by the Three Sisters Wilderness to the north. Oregon's second-largest body of natural water dwells in a basin scooped out by ancient glaciers, covers 10 square miles (6,700 acres), and is 420 feet deep at some points. On a bright day, you can see 100 feet down into the water, as this is one of the purest lakes left in the world. Waldo Lake lies just outside the eastern boundary of the Wilderness, hinting at the impressive array of beautiful trout-filled lakes scattered within, including the Six Lakes Basin, Eddeeleo Lakes, and Quinn Lakes. Here in the High Cascades the terrain is characterized by moderate to steep dissected slopes with many basins, small meadows, and rocky outcroppings peaking at 7,144 feet. Roughly 98 percent of the area stands forested in Douglas fir, western hemlock, western fir, and some true fir. The northern border of Waldo Lake Wilderness is the southern border of the very popular Three Sisters Wilderness. Some 84 miles of trails lead to many of the lakes. The Waldo Lake Trail is a 22-mile loop trail around Waldo Lake itself (outside the Wilderness), and a 2.7-mile stretch of the Pacific Crest National Scenic Trail crosses the eastern portion. From North Waldo Campground, the Rigdon Lakes Trail travels 2.4 miles to peaceful Rigdon Lakes, with a rocky butte nearby that you can climb for a fine view. The trails to Six Lakes and Wahanna Lakes receive the most traffic. Planning to Visit the Waldo Lake Wilderness? How to follow the seven standard Leave No Trace principles differs in different parts of the country (desert vs. Rocky Mountains). Click on any of the principles listed below to learn more about how they apply in the Waldo Lake Wilderness.